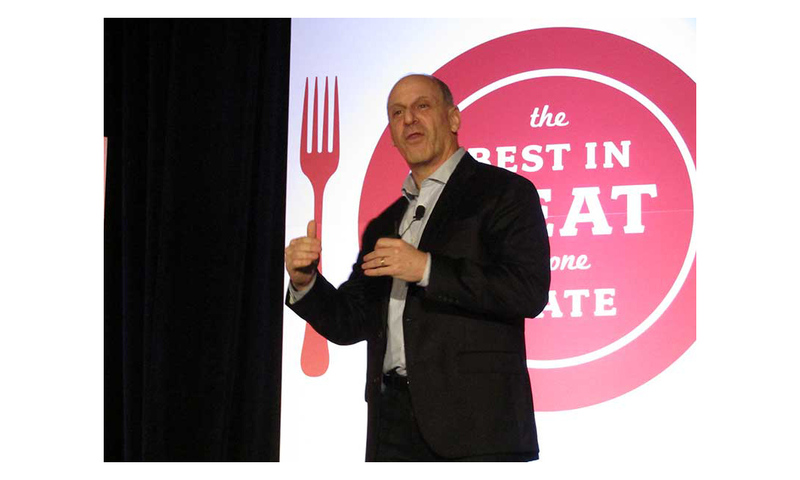 During the Annual Meat Conference in February, Neil Stern took on the challenge of discussing how grocers can maintain relevancy in the midst of a retail environment that is rapidly changing around them. Stern first addressed current macro trends—what is happening with consumers and in retail and food—and spelled out in detail a particularly disturbing trend that must be turned around. He started out with good news and a question. Consumer confidence is at 14-year highs. The economy is almost at full employment. Retail sales are generally good. “So, why do we keep hearing about ‘Retailmaggedon’?” asked Stern, who is a senior partner at retail consultancy firm McMillanDoolittle LLP. In 2017, there were record retail bankruptcies and retail store closures; somewhere around 7,000 shuttered locations. Already in 2018, New York-based Tops (and, since Stern’s talk, Florida-based Southeastern Grocers) declared bankruptcy. The retail struggle is very real and it has to do with demographics, societal trends, changing technology and, no surprise here, Amazon. The population is becoming more diverse as Hispanic and Asian populations grow in the U.S. Millennials and Generation Z (those born since 1995) are the most diverse generation yet. And a large segment of the country’s citizens, the baby boomers, are aging out of their prime purchasing years. Their money is spent on healthcare, travel and retirement. Millennials are very close behind in terms of buying power. They now are getting married, having children, forming households. In a strong economy with near full employment, not everyone is prospering. The U.S. is home to significantly fewer “haves” than “have-nots” and the divide continues to widen. “The haves are about 40 percent of (the population) and are controlling an increasing amount of the income and wealth in the country, and the have-nots, 60 percent of the country, are struggling to maintain where they are,” Stern said. Their lot may improve as low unemployment rates, including some that are breaking record lows on the state level, put pressure on wages. Stern said retailers and manufacturers must become much more efficient in their processes because they likely will have to either pay higher wages to attract top talent or pay for automation. Stern said human beings are spending one trillion minutes a month on mobile devices (he called this his “favorite stat”). That figure has doubled in the last five years. Millennials believe social media and streaming services are essential to life. They increasingly live their lives on a social basis, which impacts food trends. They tweet about meals and post food photos on Instagram. They have become interested in grocery apps and apps for pickup or meal kit delivery services on a disproportionate basis vs. other generations. And e-commerce is growing—by double digits—but still is only about 12 percent of retail sales. “But if you dig a little bit deeper into this number, you start to see the real disparities and differences in e-commerce,” Stern said. Food e-commerce is just 1.5 percent of online sales. Consider that over the holidays, one-third of apparel sales were online transactions. When 30 percent of customers stop going to retail outlets, department store dominoes fall. 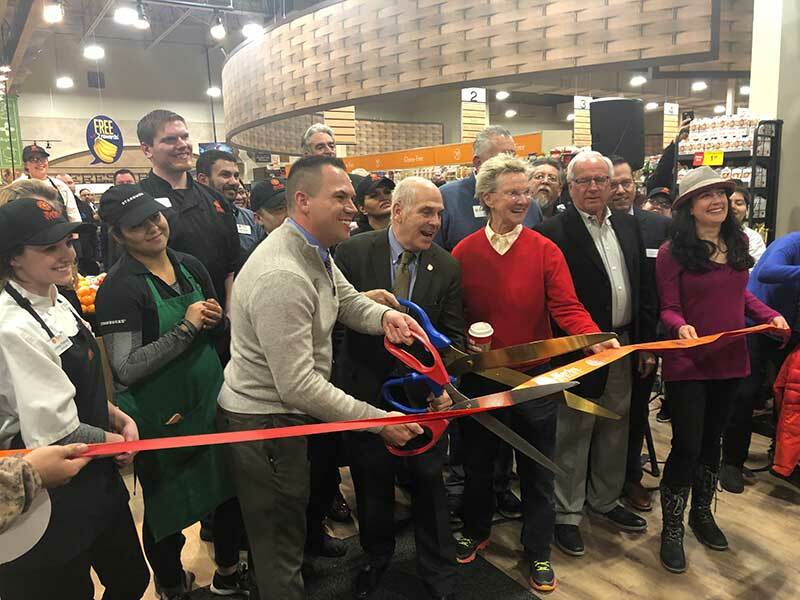 “Part of the reason why e-commerce is only 12 percent (of total sales) is because it really hasn’t penetrated food and food is far and away the biggest category we have,” Stern said. That will change because Millennials and higher-income households are budgeting more money for online spending. Then there’s the “biggest disruptor of all,” Amazon, “the fastest company ever to (make) $100 billion in sales,” Stern said. He wanted a show of hands from Amazon Prime members. Almost half of the attendees responded. He asked that question when he recently spoke at Emory University in Atlanta and every single hand went up. More than half of America’s households are Amazon Prime members, triple the number just four years ago. Amazon isn’t just attracting half of all households, but the “better” half—households with approximately $70,000 in annual income, which is 24 percent higher than the average household income overall. Brands like Nike looking to sell to those consumers have joined Amazon rather than fighting it. In 2015, the overall average U.S. household income was $56,516, which aligns almost perfectly with the average household income of Walmart shoppers: $56,000. Amazon bought Whole Foods for $13.7 billion in 2017. It was a bargain for the online retailer, according to Stern. “The stock price went up $11 billion that day; they almost bought Whole Foods for free based on market valuation,” he said. The first thing Amazon did with Whole Foods was to drop prices on about 100 items from “outrageously high prices to just high prices,” Stern said. “The question is, what is Amazon going to do with Whole Foods? And we don’t know,” he said. Amazon will try to turn Prime members who aren’t already into Whole Foods customers. It hasn’t all been chai tea for Amazon/Whole Foods. The online giant is centralizing Whole Foods’ procurement processes and that reportedly has made shoppers mad and employees cry. Amazon also opened Amazon Go, a 1,800-s.f. store with hundreds cameras but no cashiers. It isn’t only the “just walk out” technology that is disruptive; it is the offerings. 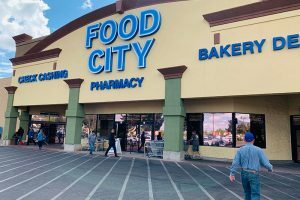 Market share already was drifting away from traditional grocers to alternatives, like supercenters, clubs and drug and dollar stores, before Amazon Prime members were so ubiquitous. Every stripe of retailer has gotten in on the grocery game. Now, Amazon has taken hold not only of the market share but also information. It influences an untold number of purchases with its customer reviews alone, let alone suggestions like “customers who viewed this item also viewed…” and “frequently bought together,” among others. Its reach has not completely infiltrated retail food—yet. 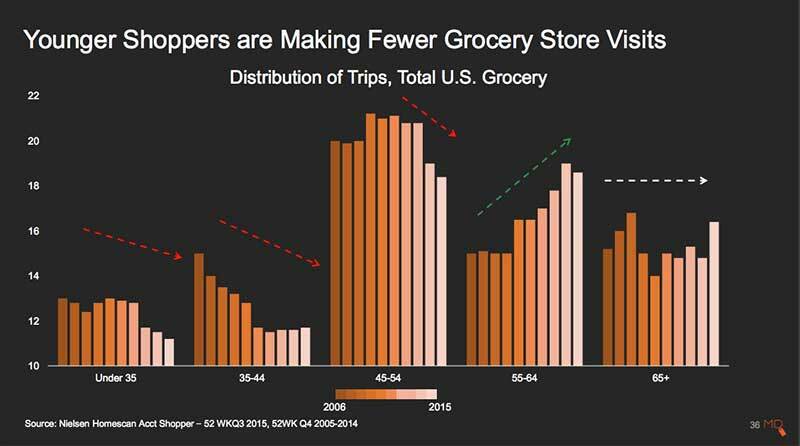 Consumers aged 55-64 still shop at the brick-and-mortar grocery store. Though the number fell a bit from 2014-15, the overall trend shows an increasing number of shopping trips from 2005-15 for this group. 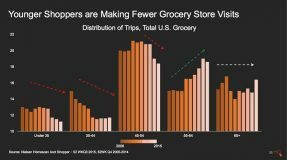 The number of grocery trips for consumers older than 64 was relatively flat during the same period. Here is the frightening part: all consumers younger than 54 took fewer grocery shopping trips from 2006-15. In our May issue, The Shelby Report of the Southwest will publish part two of our coverage of Stern’s presentation: “Maintaining Relevancy: Retail Trends Impacting Today’s World and Beyond” from the Annual Meat Conference. Stern discusses growing formats in detail and shares examples from future-looking retailers located across the globe. He also has five questions for all grocery retailers to consider as they plot for the future.